Nicole's Heart -- Why Me Lord? Join Nicole Cleveland for a cup of coffee, tea or a vi-shake as she shares her heart for hurting women. Not from any book she read, but from her real life battles, conversations and learning experiences she's had with God. Nicole understands we all need encouragement. Join Breathe Again Magazine's Encouragement Campaign. Have you ever asked the queston, "Why Me Lord? Seems like we go through the most heart wrenching things and did nothing to deserve the pain or heartache we have and are experiencing. I have cried out ( more like yelled ) on more than a few occasions..."Why Me, Lord?" Listen as I share what I have learned from asking God the question , "Why Me, Lord?" 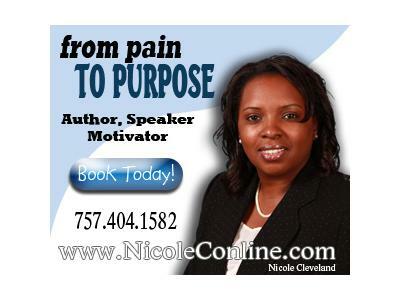 Nicole Cleveland is a speaker,author and founder of Breathe Again Magazine. She is on a mission to ensure women are not suffering in silence, as she once was.